The Enterprise Edition of OpManager consists of two distinct server components, the Central and the Probe. As the names suggest, the Central server is the component installed in the NOC or the central location from where the remote network administrator can take control of all the distributed resources over the LAN⁄WAN. The Probe is installed in the site which it is required to monitor and report the fault and performance to the Central server. You can consider deploying multiple Probes on the same LAN to distribute the load across the Probes for scalability. On the other hand, this edition lets you monitor remote sites where you can deploy the Probes in the remote networks. The Probe-Central architecture makes it possible to scale as and when you expand to more locations and multiply the resources. A site-wise segmentation de–clutters your network management tasks. You can distribute the polling engine by adding more probes for enterprise network monitoring. As you can see, scalability is the main focus of this edition. Let us see a little more on how this design works. The Central Server is installed at the NOC/Datacenter. The Probes are deployed in the remote location and are registered with the Central Server. 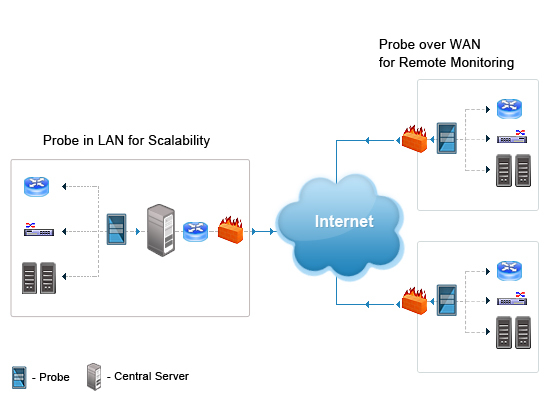 The Probes can be deployed even behind firewalls or proxy servers. The Probes discover, map, monitor, and detect faults in the networks that they are configured to monitor and report the findings to the Central Server. Communication between the Probes and Central Server is XML over HTTP⁄HTTPS, and is secure. The Central server collates the data and presents them in a unified console for easy monitoring and management. A web console is available for the Probes for the local administrator to access the required information. The centralized console on the NOC side provides a bird’s eye view of the distributed enterprise networks and their performance.